The eligibility rate for receiving regular Employment Insurance (EI) benefits was 85.4% in 2016, up from 82.8% in 2015. The increase was most notable among people aged 25 to 44 and men of all ages. In July 2016, EI policy changes came into effect that eliminated higher eligibility requirements for new entrants and re-entrants to the labour market, and simplified job-search responsibilities for beneficiaries. The changes also extended the duration of EI benefits for regions affected by the 2014-2016 commodities downturn. In 2016, 850,000 unemployed people contributed to the EI program, as they paid premiums in the 12 months preceding their unemployment spell. This represented 65.3% of all unemployed people, unchanged from 2015. In addition to having contributed to the EI program, eligibility to receive regular benefits requires that unemployed individuals meet the criteria for a valid job separation and have accumulated a sufficient number of insurable hours (see note to readers). Of the 850,000 unemployed contributors, 81.7% or 695,000 had a valid job separation in 2016, up slightly from 2015 (+1.0% or +7,100). Of unemployed contributors with a valid job separation, 85.4% or 593,000 had accumulated a sufficient number of insurable hours to be eligible to receive regular EI benefits in 2016. See chart "Employment Insurance coverage and eligibility, 2016." Eligibility rates for regular EI benefits varied across Canada, ranging from 75.3% in Manitoba to 98.5% in Prince Edward Island in 2016. Compared with 2015, the EI eligibility rate grew in six provinces. The largest increase was in British Columbia, where the rate rose 12.1 percentage points to 87.3%, primarily due to an increase in the number of eligible contributors. Increases were also observed in Nova Scotia, Alberta, Prince Edward Island, Quebec and Newfoundland and Labrador. Over the same period, EI eligibility rates declined in Saskatchewan, Manitoba, Ontario and New Brunswick. Men accounted for slightly more than two-thirds of unemployed people who contributed to the EI program and had a valid job separation in 2016. This reflects the fact that men generally have a higher unemployment rate than women. According to the Labour Force Survey, the unemployment rate in 2016 was 7.7% for men and 6.2% for women. In 2016, 87.2% of unemployed male contributors with a valid job separation had enough insurable hours to be eligible to receive regular benefits, up from 82.0% in 2015 and the highest rate since 2013. For women, the eligibility rate was 81.6%, down from 84.3% in 2015 and similar to the rate observed in 2014. Slightly fewer than 6 in 10 unemployed women contributed to EI in 2016, compared with just over 7 in 10 of their male counterparts. Fewer women than men contributed to the EI program, as fewer unemployed women had paid employment in the previous 12 months. Among people aged 25 to 44, the eligibility rate increased from 82.1% in 2015 to 88.4% in 2016, mainly the result of an increase in contributors who accumulated a sufficient number of insurable hours. The eligibility rate for people aged 45 and older also rose, from 90.7% in 2015 to 94.0% in 2016, the highest rate on record since comparable data became available in 2003. For youth aged 15 to 24, the eligibility rate was 50.8% in 2016, down from 54.0% in 2015. The gap in eligibility rates between youth and the older age groups has been consistent over time, as youth are less likely to accumulate sufficient insurable hours and are more likely to have an invalid job separation. There are two main reasons for not contributing to the EI program: not having worked in the previous 12 months (which includes those who have never worked) and non-insurable employment. Of the 1.3 million unemployed people in Canada in 2016, 34.7% or 452,000 had not contributed to EI, making them ineligible for regular benefits. This rate was the same as in 2015, which was the lowest rate since 2009. Women (43.2%) had a higher non-contribution rate than men (29.1%). This was consistent with the fact that women were less likely to have had paid employment in the previous 12 months. The non-contribution rate decreases with age. In 2016, youth had the highest rate at 43.8%, followed by people aged 25 to 44 (34.5%) and those aged 45 and older (28.8%). 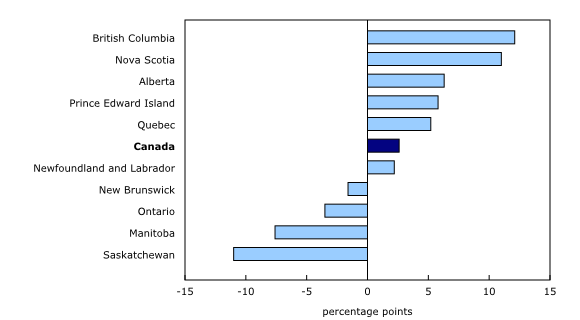 Unemployed people in Ontario were the most likely to be non-contributors (42.3%). As in past years, those in the Atlantic region were the least likely (19.3%). The non-contribution rate was approximately one-third in the rest of the country: 34.4% in Quebec, 31.3% in the Prairies, and 30.1% in British Columbia. Among all unemployed people who were EI contributors in 2016, about one-fifth or 156,000 were ineligible to receive benefits because they left their job for a reason not deemed valid by the program. This was down slightly compared with 2015. In 2016, among unemployed women who were EI contributors, 24.1% had left their job for a reason that rendered them ineligible to collect benefits, compared with 15.2% of their male counterparts. This gap largely reflects differences between women and men who quit their jobs for reasons aside from returning to school. Youth are the most likely unemployed contributors to be ineligible for benefits based on the reason for leaving their job (41.9%), largely due to having a higher proportion of workers quitting their job to go to school. They were followed by those aged 25 to 44 (16.0%) and those aged 45 and older (8.4%). Ontario had the highest proportion of unemployed contributors with invalid job separations (24.9%), followed by Manitoba (23.9%) and British Columbia (21.4%). The lowest proportion was in the Atlantic region (9.0%). Coverage and eligibility of mothers for maternity or parental benefits under the EI program have been relatively unchanged since 2003. In 2016, 75.5% of all recent mothers (those with a child aged 12 months or less) had insurable employment, virtually unchanged from 2015. Among these insured mothers, 91.1% received maternity or parental benefits, up from 87.2% in 2015. Quebec, which provides separate maternity and parental benefits through the Quebec Parental Insurance Plan (QPIP), had the largest share of recent mothers with insurable employment (86.5%) and continued to have a relatively high proportion of insured recent mothers receiving maternity or parental benefits (96.9%). The share of new mothers with insurable employment who received maternity or parental benefits in the rest of Canada increased by 5.8 percentage points in 2016, to 88.8%. The most common reasons reported by mothers not receiving or claiming benefits were "was not paying EI premiums/work was not insurable" and "employed or expecting to return to work." For all provinces combined, the share of recent fathers who claimed or intended to claim parental benefits in 2016 was 29.9%, virtually unchanged from 2015. The QPIP, which was introduced in 2006, has had a major impact on the number of fathers who claimed or intended to claim parental benefits in Quebec. It includes leave that applies exclusively to fathers. 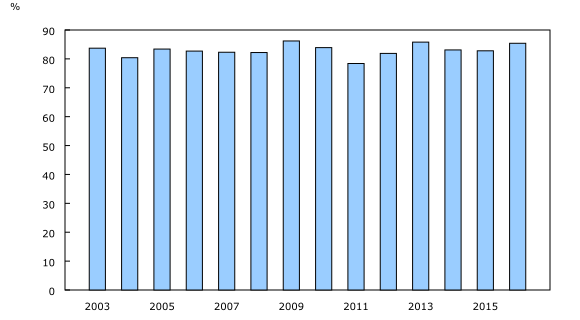 The proportion of new fathers in Quebec who claimed or intended to claim parental benefits increased by 58.0 percentage points, from 27.8% in 2005 to 85.8% in 2015. In 2016, the proportion declined 5.7 percentage points to 80.1%. The proportion of new fathers in the rest of Canada who claimed or intended to claim parental benefits increased by 1.0 percentage points, from 11.9% in 2015 to 12.9% in 2016. The Employment Insurance Coverage Survey sheds light on the coverage of the Employment Insurance (EI) program. It provides a picture of who does or does not have access to EI regular benefits, as well as to maternity and parental benefits. To be eligible to receive regular benefits, unemployed individuals have to: (a) contribute to the EI program, (b) meet the criteria for job separation (that is, have a valid job separation) and (c) have accumulated enough insurable hours over the past 12 months. Job separations that are deemed invalid to receive regular benefits include, among others, quitting the job without just cause (including leaving a job to go to school, dissatisfaction with the job and retirement) or dismissal with cause. The number of unemployed people who had accumulated enough insurable hours to be eligible to receive regular EI benefits, expressed as a proportion of unemployed people who were covered by the EI program and separated from their job for a reason deemed valid by the program, is known as the "eligibility rate." The number of insured hours required to qualify for regular benefits varies across geographic regions, ranging from 420 to 700 hours, depending on the region's unemployment rate. The higher the unemployment rate, the lower the number of hours required to qualify for benefits. The survey is administered to a sub-sample of respondents of the Labour Force Survey (LFS) four times a year, in April, July, November and January. Respondents are asked questions about their situation during the LFS reference week in the month prior to being interviewed (March, June, October and December respectively). The estimates are produced for the reference year by averaging over the four cycles covered by the survey. In 2016, the total sample size was 14,359 people, composed of unemployed individuals (as defined by the LFS) and other individuals who, given their recent status in the labour market, were potentially eligible for EI. The survey is conducted on behalf of Employment and Social Development Canada. The product Employment Insurance Coverage Survey: Public Use Microdata Files, 2016 (Catalogue number89M0025X), is now available. To order the product, contact us (toll-free: 1-800-263-1136; 514-283-8300; STATCAN.infostats-infostats.STATCAN@canada.ca) or Client Services (toll-free: 1-866-873-8788; statcan.labour-travail.statcan@canada.ca), Labour Statistics Division. To enquire about the concepts, methods or data quality of this release, contact Emmanuelle Bourbeau (613-951-3007; emmanuelle.bourbeau@canada.ca), Labour Statistics Division or Client Services (toll-free: 1-866-873-8788; statcan.labour-travail.statcan@canada.ca), Labour Statistics Division.